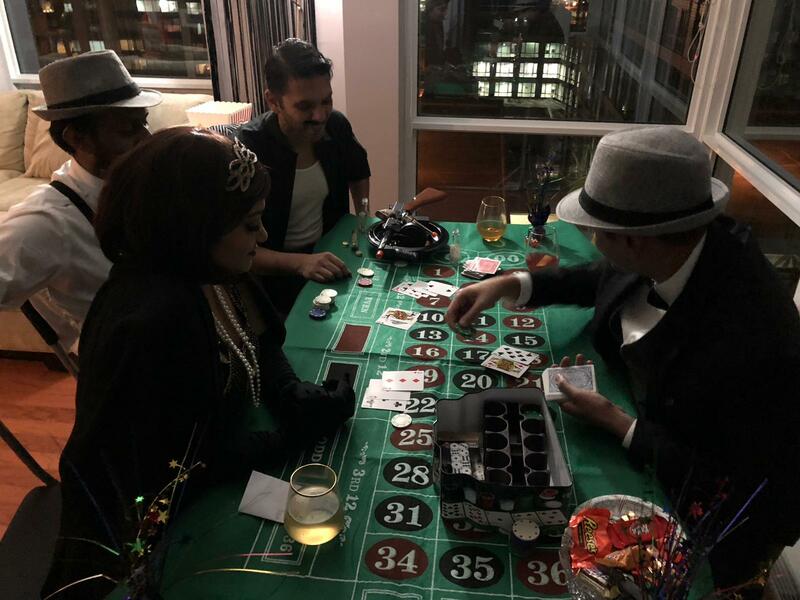 Around this time last year, my friend Pooja and I threw a Harry Potter themed party for a group of our friends and family – we were so impressed when everyone arrived in creative character costumes, and our guests were equally impressed with our themed decorations, food, and games. 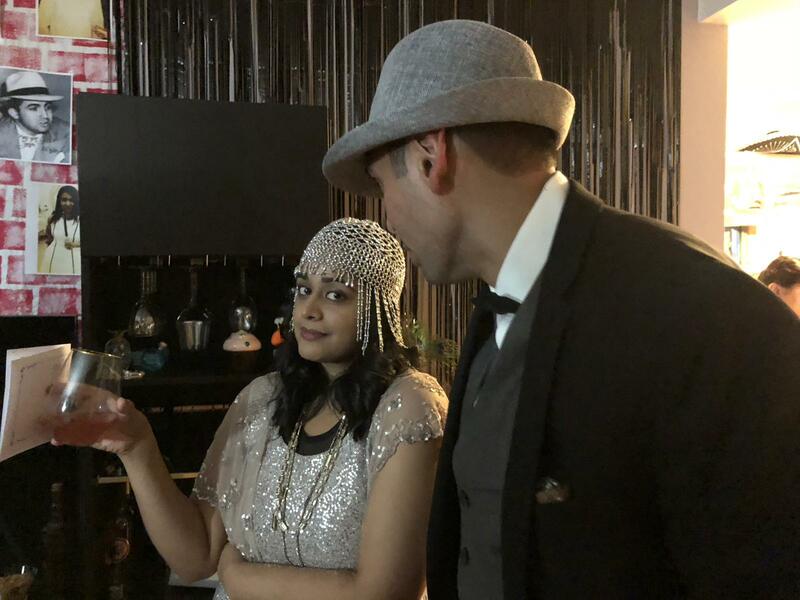 So this year, we set ourselves to the steep task of surpassing last year’s party with a murder mystery dinner – 1920s style. 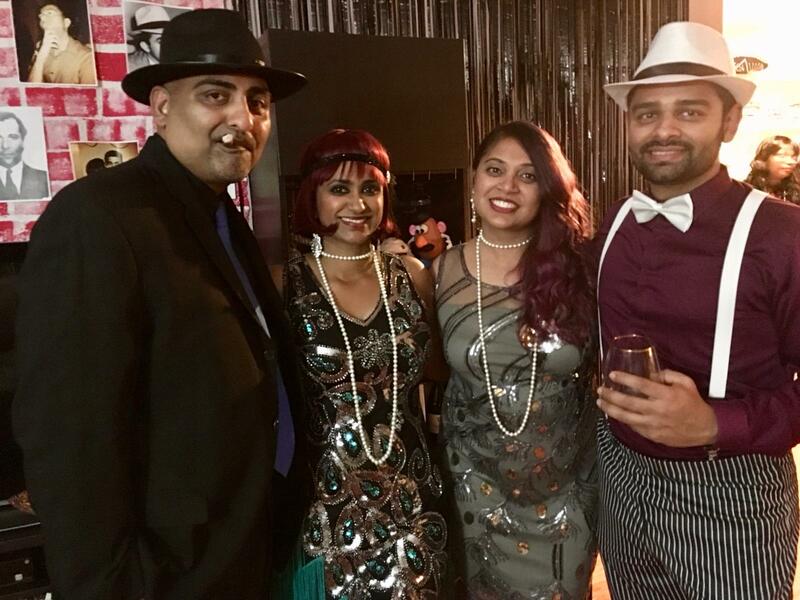 While we knew our guests would come dressed to play, we were blown away with their commitment to costume and character! 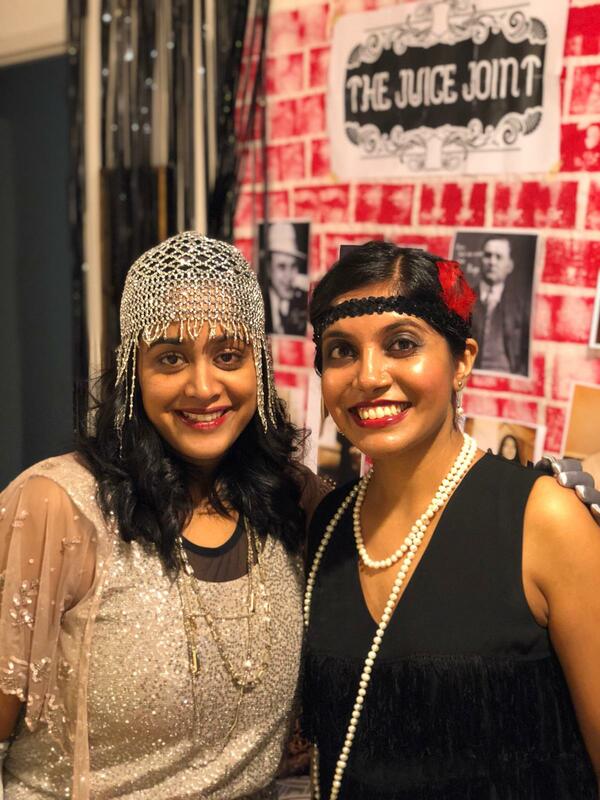 Decorations and Music – Our speakeasy had exposed brick walls, complete with pictures of all of our regulars, and black foil fringe curtains to add some glamour. 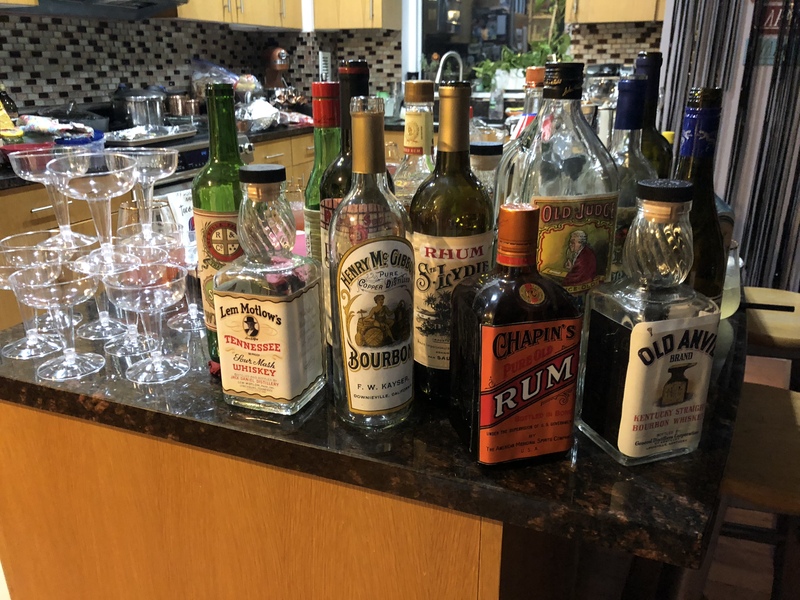 The bar was stocked with spirits supplied by Bernie Bootlegger. 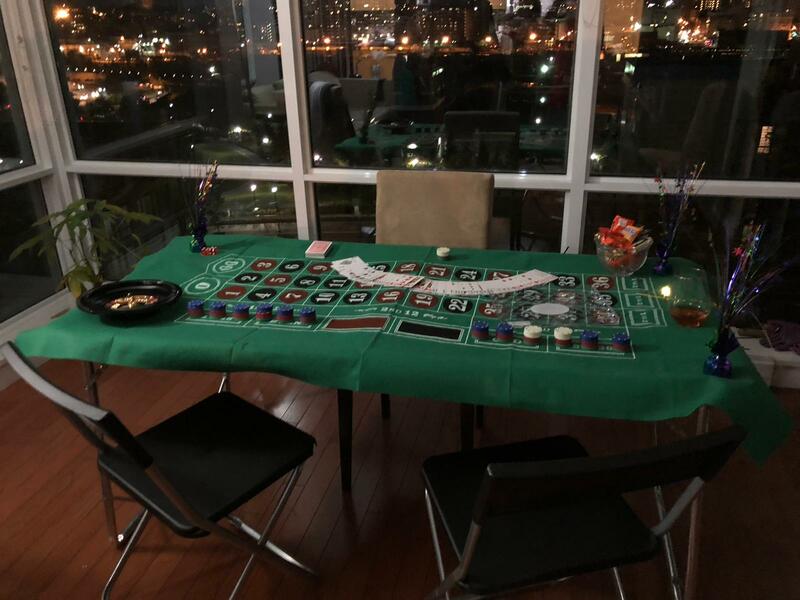 We also had a roulette/blackjack table – poker chips were the currency used at our Juice Joint to buy and sell information and favors – and there may have been some pickpocketing! Low lights and candles provided the perfect ambiance for covert conversation and inconspicuous eavesdropping. 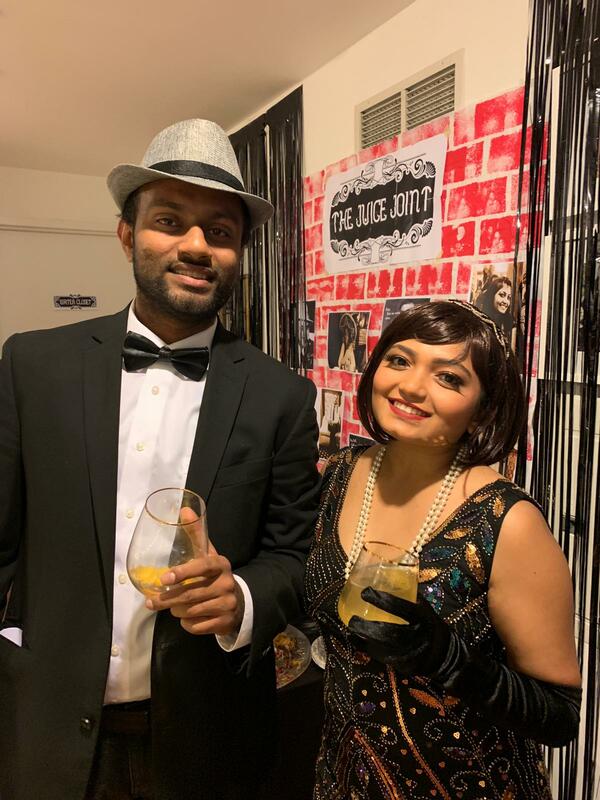 The Juice Joint band (i.e., Spotify) played a curated mix of 1920s songs, contemporary hits performed in the 1920s style (we recommend Post-Modern Jukebox!) and soundtracks of movies set in the 1920s. 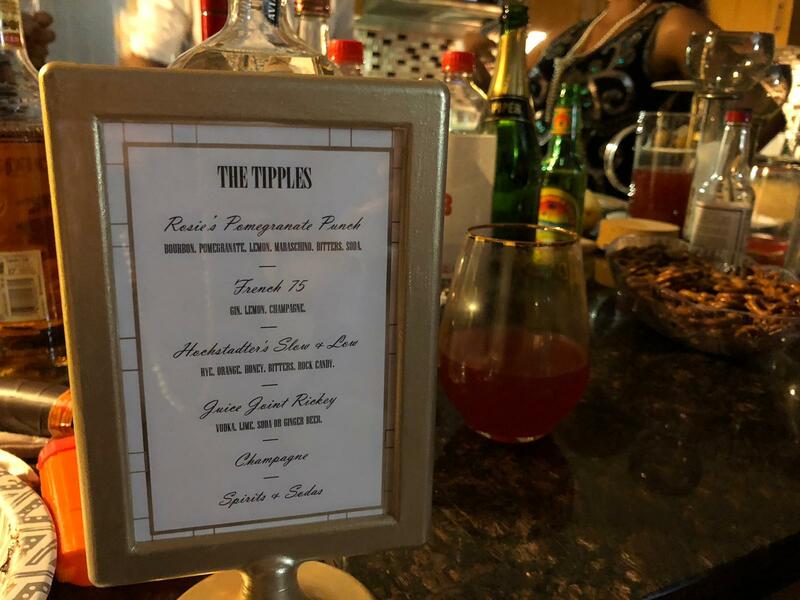 Food and Drink – We printed and framed menus listing The Chow and The Tipples available at the Juice Joint that night. 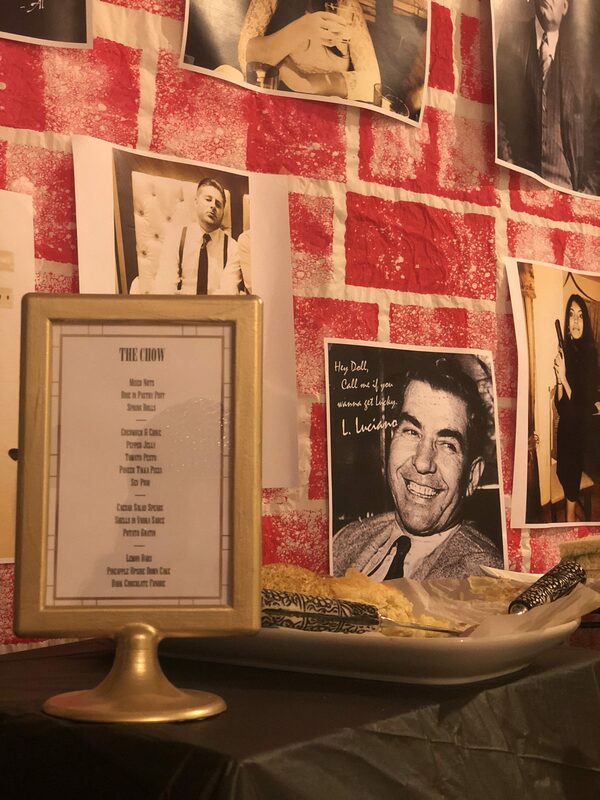 Based on some easy Google research, we decided to have primarily finger foods and canapés as was popular in the 1920s, together with Caesar salad, pasta, and potatoes gratin. 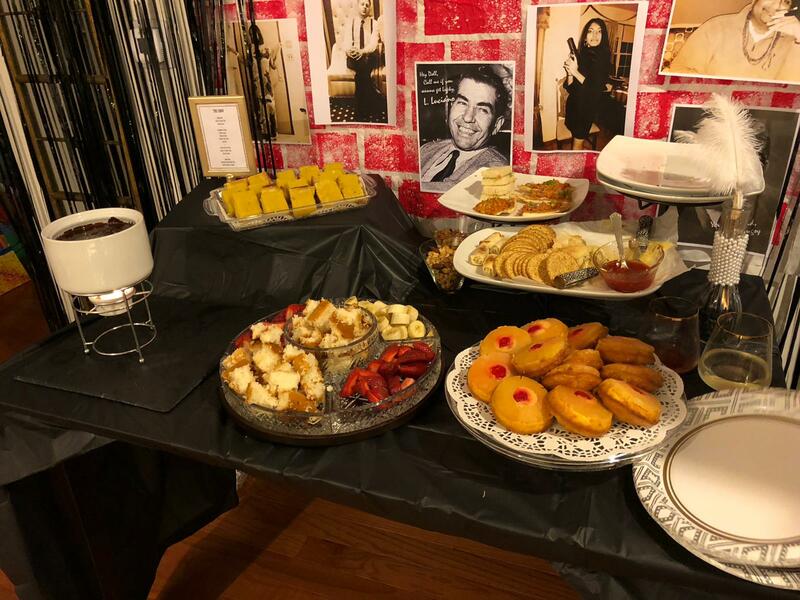 Desserts included individual pineapple upside-down cakes, lemon bars and dark chocolate fondue. We designed our cocktails with the popular spirits of prohibition in mind – bourbon, gin and champagne. The Mystery – We sent our character assignments by email approximately two weeks before the party, and immediately everyone started trying to learn everyone else’s character. 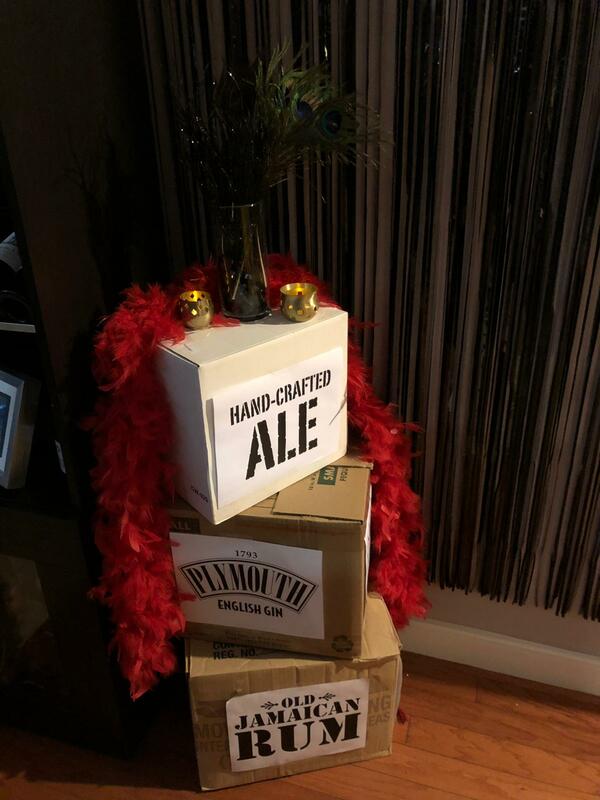 That was our first indication that this was going to be a great party! We included in the invitations a secret password that must be spoken to gain access to the Juice Joint (the password? Juicy Juice.). The guests arrived in character and employed all kinds of tactics to gain information, favors, and allies. Kitty Cocktail circulated the Juice Joint with a tray of goodies including cigars, cigarettes and even mustaches (because who knows when you’ll need a disguise?). 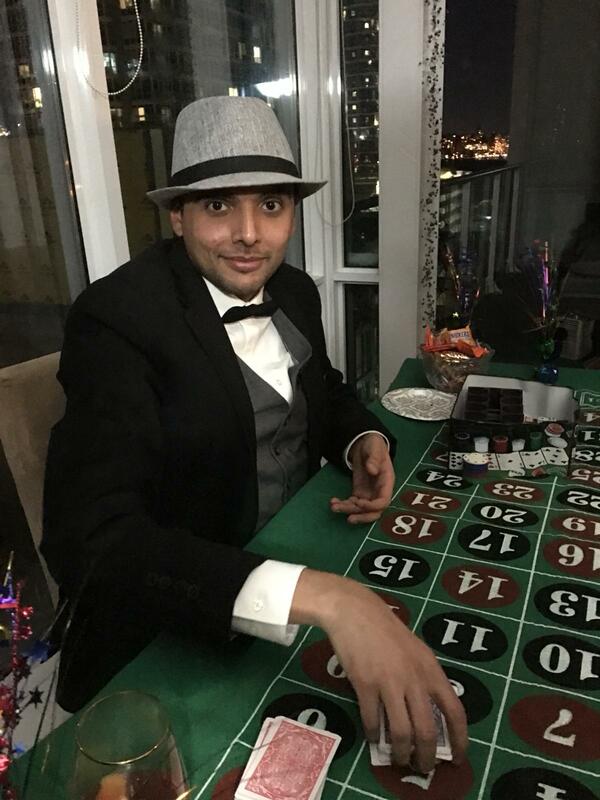 Mayor Biggs arrived with shot-sized bottles of each guest’s favorite liquor in order to buy – er, canvas – for votes, and also was seen dealing at the blackjack table, and maybe even paying out “winnings” in excess of the house bets. Rosie Marie kept the booze flowing, and everyone had a great time trying to figure out who to trust and who to bust. 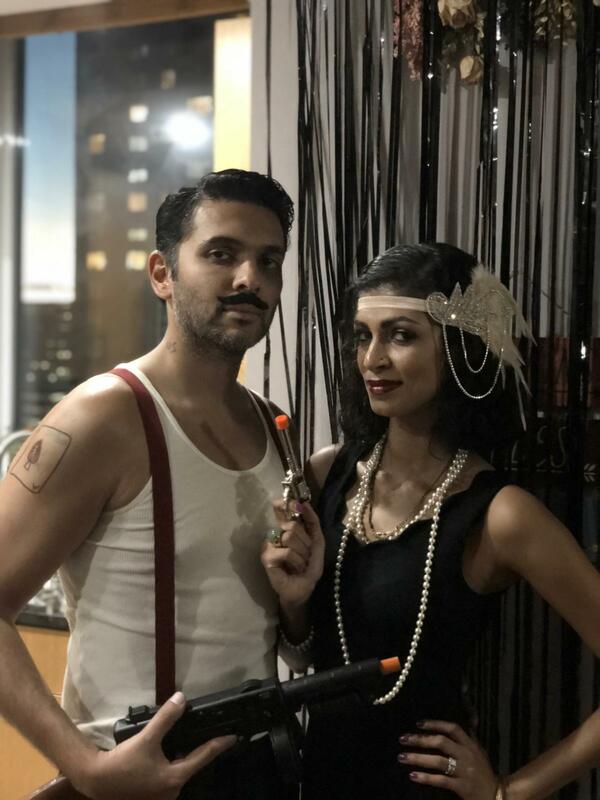 In the end, two guests solved the murder, and everyone had a fantastic time. 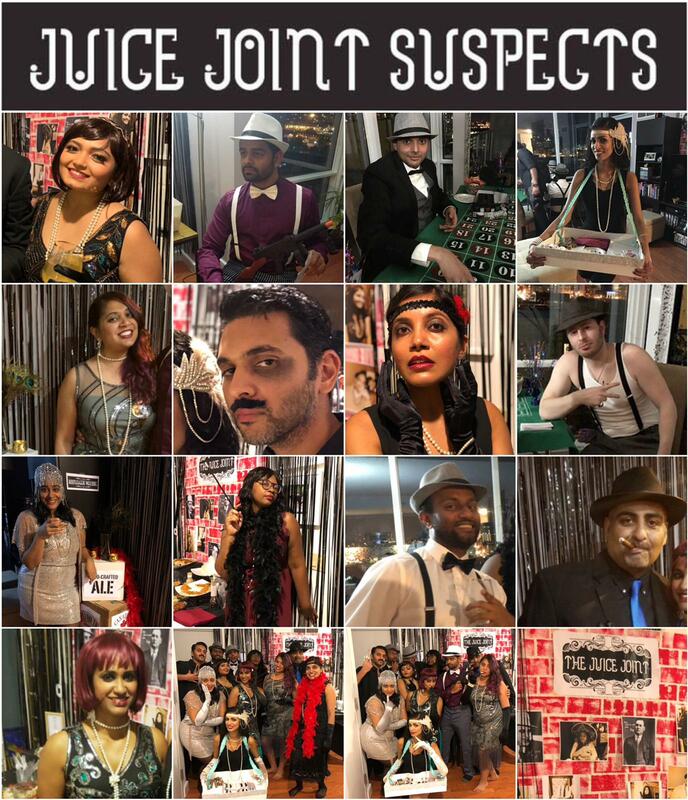 Click here for more pictures from this and other Murder at The Juice Joint Night of Mystery Parties!